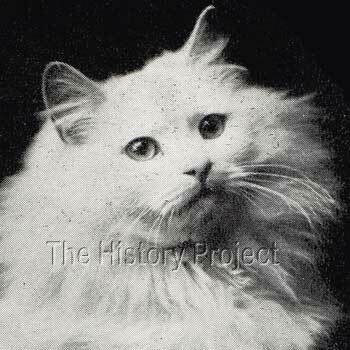 Photo: The Cat Review May 19143. Courtesy of The CFA Foundation, Inc.
'Kilravock Don Giovanni' comes from one, of a small number of early elite East Coast catteries in United States, that specialised almost exclusively, in White Persians. The famous whites of Mrs J. R. Kroeh's 'Kilravock' cattery left an enduring mark on the breeding of White Persians in that country and indeed, the pedigree of 'Don Giovanni' reads like a veritable who's who of Whites from the earliest American-bred whites, to an almost full complement of the very best of English imported bloodlines. 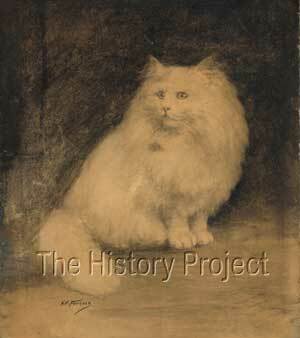 He was also the subject of a drawing executed by well-known New York animal painter Mrs. Harriett V. Furness (presumably at some point in time between 1911 and 1914), and it is thanks to this artist's grand efforts, that a clear image of this handsome cat survives to this day. 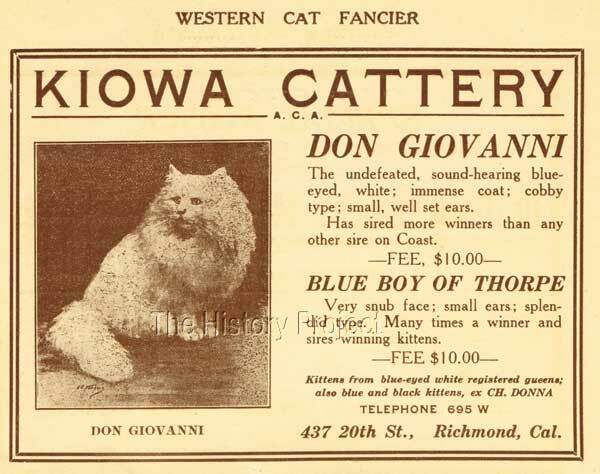 Although a photograph of Kilravock Don Giovanni also survives, published in the Studbook of The Cat Fanciers' Association, Vol.II, this is sadly a small and somewhat blurred image. From the rendering by Mrs. Furness, we get a much clearer picture of the striking qualities of this American-bred 'Blue-eyed' White male. 'Don Giovanni' was born 9th July 1908. He was bred by Mrs. J.R.Kroeh, from Orange, New Jersey; sired by Mrs. George Gould's blue-eyed White male, 'Double Champion Sousa', and out of Mrs. Kroeh's own blue-eyed white queen, 'Kilravock Magnolia II'. 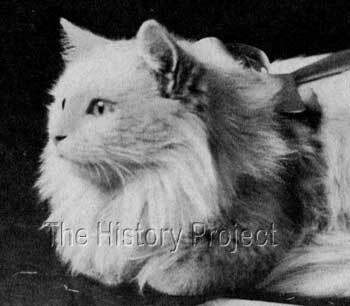 His sire was a well-known prize-winning male in his own right, having been shown for the first time at Rochester, New York, in 1905, where he won first prize in the 'Open' class, first prize in Novice, and four specials, one for the Best White male cat in the show. His second outing was at Madison Square Garden in January 1906, where he won first prize in the 'Open' once more, and a medal for best blue-eyed white male in show. Another later win was gained at Cleveland Ohio and he is said to have been valued at $1,000 US Dollars. 'Don Giovanni's' dam was from Miss J. Kroeh's exclusive stable of 'Kilravock' white Persians, which over the years included such famous cats as 'Kilravock Chorister',(born 1905, and half-brother to the dam of 'Don Giovanni), 'Kilravock Don Leone', (litter brother to 'Don Giovanni'),'Kilravock Don Leone II' (born 1911, the son of 'Don Leone') and the superlative female 'Kilravock Ivory Rose' (born 1921, and a grand-daughter of Don Giovanni's full sister, 'Kilravock Magnolia III'). 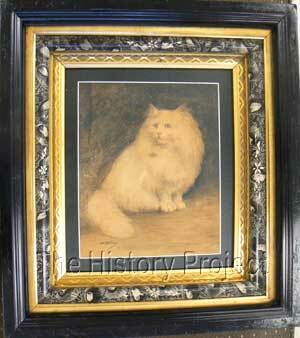 'Ivory Rose' also had the distinction of being chosen to feature in the Cowan's Noted Cats series of Collector's Cards, published in 1925. In fact, 'Don Giovanni's pedigree brings together what must surely be one of the greatest arrays of the most famous white Persian and/or Angora cats to be found admixed together. Through his sire, 'Ch. Sousa' (1902), a son of 'Prince of Pearls'(1898),(once owned by Mrs. E. Pettit), and a daughter of Mrs. Norton's 'Royal Norton' (1898) we can trace back through to 'Madge Norton' (aka 'Madge') one of the foundations of whites in the United States. Through his dam, 'Kilravock Magnolia II', we find that her sire is the incomparable 'Eng.Ch. Oberon', (owned by Miss Ava Pollard of New York), who combines together the lines of 'The White Knight' with those of 'Ch. White Friar' through none other than 'Edelweiss of Kensington' (aka Blue-Eyed Edelweiss), the product of the incomparable pairing of 'Ch. White Friar' and 'Ch. Crystal'. And if that was not enough, through the Don's maternal grand-dam, we find 'White Hussar of the Midlands' by 'White Hussar', and again on her maternal side, the redoubtable 'Lord Gwynne' owned by Mrs. Clinton Locke, who traces his lines back to 'The Masher', once owned by Mr. A.A. Clarke in England. So it becomes clear, that to Miss Kroeh and to the eventual purchaser of 'Don Giovanni' (Mrs. J.L Renner of the 'Sausalito' Cattery, based originally in Medford, Oregon and then later in Oakland, California) that the pedigrees of their white cats, were most important and should trace back to the very best white longhair stock that ever graced the show bench on both sides of the Atlantic. Registration records provide information for one litter sibling and one other full sibling from a repeat breeding. These were a blue-eyed White male, from the same litter named 'Kilravock Don Leone' and a blue-eyed white female, from a repeat litter born 23rd May, 1909; 'Kilravock Magnolia III'. A lovely photographic portrait of 'Don Leone' is given in Volume II of The Stud Book of The Cat Fanciers' Association (1912) and in it we can clearly see the close physical resemblance between the two sibling males. Although there are a number of sire and dam siblings, none appear to have compared with the consistent producers from the above combinations. From the available registration records 'Don Giovanni' appears to have been a working sire between the years 1910 through to 1918. He was bred predominantly to blue-eyed white queens, but his amores included both a blue and a black Persian queen and an odd-eyed white. The odd-eyed white queen was 'Woodverge The White Sister', a daughter of 'Kilravock Chorister'. From this pairing was produced Mrs. G.C. Gillespie's blue-eyed male, 'Woodverge Sweet William', born 18th May, 1910. In the photograph below we see that this combination produced a well-coated, well-boned male of cobby conformation. Image courtesy of The CFA Foundation,Inc. Original charcoal illustration of 'Kilravock Don Gionvanni' by H.V.Furness executed c.1910-1914 now in the collection of The CFA Foundation, Inc. Images courtesy of The CFA Foundation,Inc. Photograph of the above illustration by H.V. Furness as it appeared in The Cat Review, in 1914. 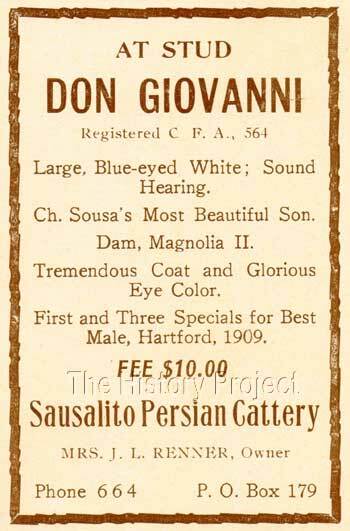 Stud advert for 'Kilravock Don Giovanni', the Blue-eyed White son of 'Ch.Sousa'. 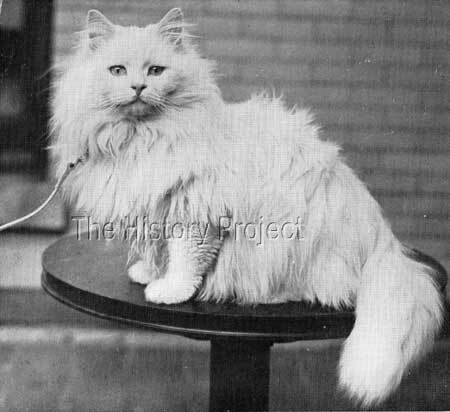 From the latter part of the first decade of the twentieth century through to the beginning of the third decade, Miss Kroeh's Kilravock cats represented one of the most famous dynastic bloodlines among white Persians in the United States. A study of their pedigrees demonstrates that this was a breeder who knew the benefit of line-breeding and selective outcrossing, of not being afraid to bring back an older line in a female to line-breed to a 4th generation male, himself bred down from the original bloodstock. This can only be achieved by someone of considerable experience and consistency; with an accumulated storehouse of knowledge and memory of the physical strengths and weaknesses of all the breeding that has gone before, and the courage to practically apply this knowledge, down the ensuing generations. The work of all great breeders who stand the test of time, can be seen in the pedigrees they have ultimately constructed and left behind. This is where we find generation after generation of one cattery name, and multiple layers of specific combinations or related strata's, artfully woven into the structure of the pedigree. We see evidence of these pedigrees, consistently being picked up by later breeders who have studied and admired the work of their predecessors, and who now themselves take up the mantle of creating and weaving a new pattern or mix of bloodlines into their own breeding programs. 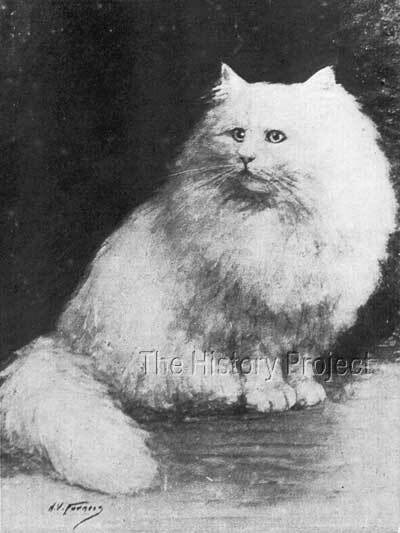 'Kilravock Don Giovanni' is just one brick in the wall of 'Kilravock' cats that have this contributed to the journey of the White Persian in the United States, now a full century ago. How fortunate we are to have his image by a contemporary artist, safely preserved in perpetuity in the collection of The CFA Foundation's Feline Historical Museum in Alliance, Ohio.